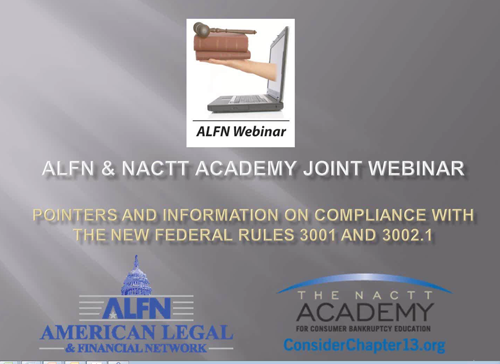 On June 1st, the American Legal and Financial Network (ALFN) and the NACTT Academy proudly co-produced a webinar: Amendments to the Federal Rules of Bankruptcy Procedure. 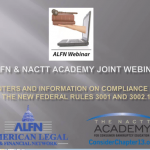 In this webinar Debra L. Miller, Esq., Chapter 13 Trustee, Northern District of Indiana and Frederic Lawrence, Esq., Nelson & Frankenberger focus on Amendments to the Federal Rules of Bankruptcy Procedure, specifically Rule 3001 as to Proof of Claims and Rule 3002.1 related to noticing issues concerning mortgages. Windows users (and Mac users with .wmv support installed) can click here and begin watching the webinar. You can also view a PPT copy of the webinar materials that were covered by CLICKING HERE. Click here to access a copy of the Bankruptcy Rules. Click here to access a copy of the New Proof of Claim Form. Click here to access a copy of the Mortgage Proof of Claim Attachment. Click here to access a copy of the Notice of Mortgage Payment Change Form. Click here to access a copy of the Notice of Postpetition Mortgage Fees, Expenses and Charges. Click here to access a copy of the Notice of Final Cure Payment.